One of the Animal Kingdom's attraction that we went to is the Kali River Rapids. To get in, you have to fall in line (it's long as usual.) Waiting in line is hard especially if you have kids but at the end of the line, there is this ancient Southeast Asian temple where there are neat and interesting displays that entertained us while we waited for our turn..
At least, you will be entertained looking at these displays before you can ride the white raft. 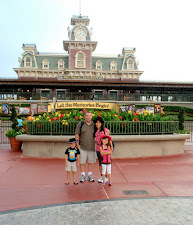 Good thing, we spent our Disney vacation with our family friend, the Dias family from Texas. Our Burritos got to play with their friend Akesha. Happy happy birthday dear Akesh, we wish you a healthy and happy life. We miss and love you! The line was so long but the ride itself only takes 3 to 4 minutes which is not enough to compensate the time you've waited in line. I was glad that we did it in the afternoon when the weather was so hot because when we got wet, we felt a little refreshed. The ride did not have a tour guide, so navigation was fully depend on the twist and turn that the raft will bump into. We designated our son as the captain of our raft that day lol. We all got wet but with smiles in our faces. It was a fun and exciting adventure that was full of twist and turns in a rapid river. Thanks a lot for visiting and for leaving me your thoughts. this is a great exposure for the kids. looks like a lot of fun, too. I wouldn't mind the long wait if I will get to watch interesting things like these. Have a fabulous week. those pictures are beautiful Sis, what a great adventures for the kids :-) Dropping by from BM. Exotic displays that definitely offer great photo opportunities! I am sure the ride was a thrill for everyone! Oh so nice to have such wonderful adventures as a family. Thanks for sharing. NICE, but I really don't enjoy it when the queue is SO much longer than the event! What a wonderful trip, thanks for sharing it. A great trip! Thanks for sharing. There are some nice shots in this post! woot! love the pics sis. parang nasa Asia kayo. hehehe visiting from TT. Thanks for joining TT last week's sis! You are very welcome to constantly join and I am inviting to share your travel post again for this week. Linky is now up!